June - thank you for bringing the summer! Although I'll be the first to admit that I did say the words "too hot" once... or maybe twice! The end of another month means another empties post; one of my favourite posts to write and to read. I'm so sad that this facial oil is empty - it's like a little bottle of expensive magic! It's extremely nourishing and makes my skin look bright and healthy. I used it as a treat a couple of times a week and occasionally popped a few drops into my hand cream at night. Full review here. Re-purchase? It's on the list! If you're looking for a light but hydrating serum for your morning skincare routine, then I recommend this brilliant one from Antipodes. It contains natural ingredients like Vinanza Grape and Mamaku Black Fern Extract and I can see this being suitable for most skintypes as it's so gentle. Full review here. Re-purchase? Yes I already have. This has been my morning cleanser for about a year now - because you only need a pea sized amount it lasts for ages. When you add water it lathers into a light foam, yet doesn't contain SLS or any other stripping ingredients and doesn't give it that horrible "squeaky clean" feeling. Re-purchase? I have a few others to use up, but as it turned out to be such good value I'm considering it! Regularly popping up in my empties posts is possibly my favourite ever pressed powder from Green People. If you're looking to go talc free with your makeup, then I can't rate this enough. Full review here. This mini came in a BBB Beauty Box ages ago and I've only just got round to using it! Sweet Almond and Starflower Oils make the skin really soft and the Jasmine and Ylang Ylang scent is lovely - calming and soothing. The only thing is I felt like I needed to use quite a bit of the product to get these results. In my opinion this is a completely underrated eyeshadow base - it ensures eyeshadow stays put all day and intensifies the colour dramatically. My only negative is that it's shimmery, which doesn't pair well with matte eyeshadows. Full review here. Re-purchase? Maybe, as it is a very good price. What empties have you used up this month? Are you a fan of any of the products I've used up? 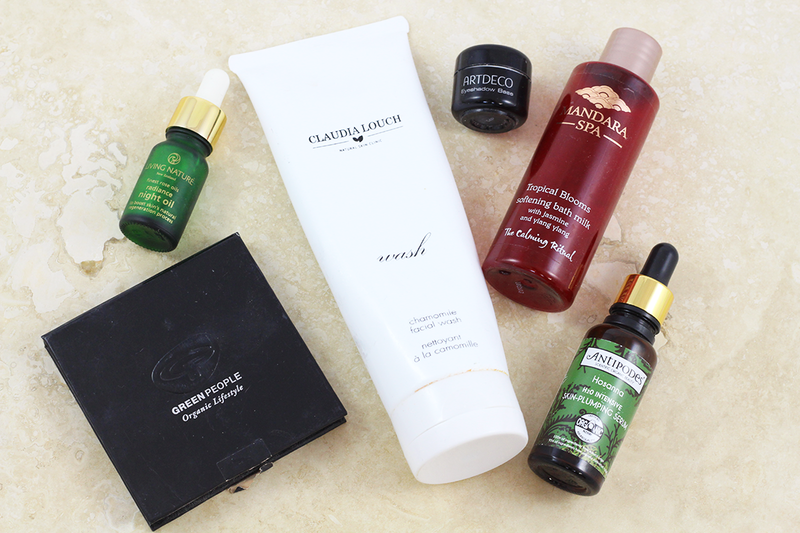 Great post as always, I tried my first Mandala Spa moisturiser recently and it's gorgeous! Ooooh I do want to try this serum! I really like the Artdeco eyeshadow primer too! I totally agree with you that not many people know about it but they really should. It's pretty great! I have a small bottle of the Mandara bath soak, and I am looking forward to trying it! It's a shame if you have to use a lot for it to work though!